The gap between Ribbon Reef Number 5 and Ribbon Reef Number 6 is quite large compared to some of the other entrances to the inside of the Great Barrier Reef. 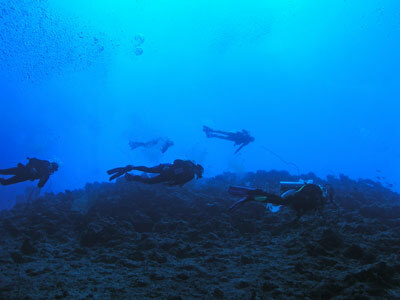 This dive was planned as a drift dive from outside the Reef through the gap to the inside lagoon. We were dropped off about 200 metres to the south of the entrance. The GPS Reading for this location is S15° 19' 48.6" E145° 46' 57.7". It is 132 kilometres from Port Douglas. Once we entered the water we discovered this was not such a good plan, as the current was running from north to south rather than south to north. It was about 0.5 knots, hard to swim against, but not impossible. 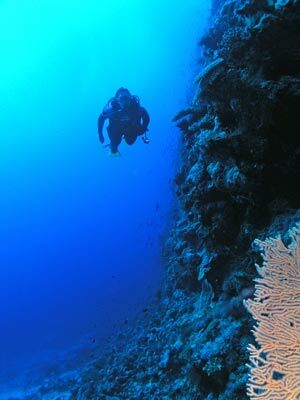 Where we hit the bottom the reef was a shear vertical wall. It dropped to about 35 metres right on the wall and then sloped to over 45 metres out further. There are a few really nice gorgonias and sea whips on the bottom and wall. The depth right on the wall bottom comes up gradually over the next 10 minutes (if you have a current behind you or 20 minutes if you have to swim into the current) to about 20 metres. About half way along this section there is a cave at about 15 metres. This is really an L shaped tunnel, the top of which seems to come out on the top of the reef. You can get some nice visual effects on photos taken looking out and up. A bit futher along the reef on the edge of the wall drops back to 25 metres and a ridge runs off north while the main reef turns north-west. 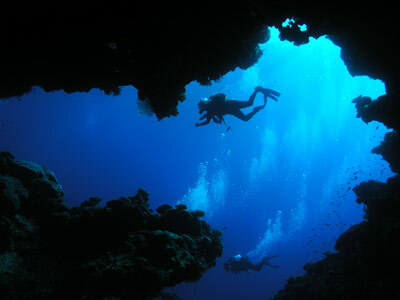 The depth comes back up to 18 metres and later about 12 metres. As we were swimming against the current, we did not make it back inside the reef nor did we even make it to the main part of the entrance. There were ridges out to the north of us and the main reef to the south was some distance off (it was a gradual slope back to it). We ended up ascending here and were picked up by the boat. 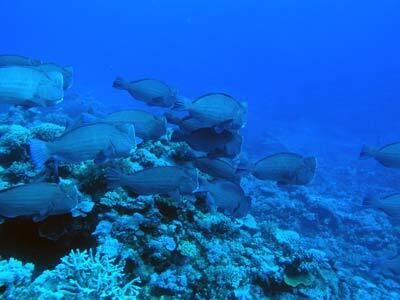 Along we way we saw huge schools of double-humped parrotfish. These were not the biggest I have seen, but the school number 50 or more. We either saw this same school again or another one. I also saw a grey reef shark and a couple of white-tipped reef sharks. There were also a lot of barracuda and all the normal fish. Visibility was at least 50 metres, as good as it gets. A pity the dive was not better organised.